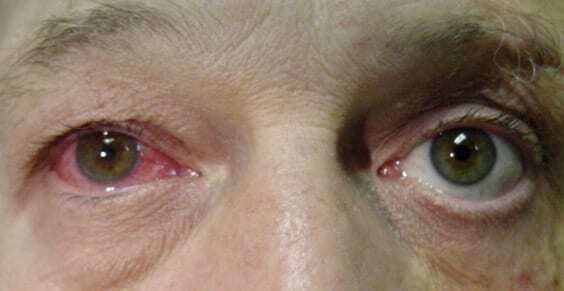 A 60 year-old man presents to the emergency department with a painful and red right eye. The pain started yesterday, and has progressed to a deep ache radiating to his right temporal region. His eye pain is exacerbated by eye movements, reading and bright lights. He has normal visual acuity but has direct and consensual photophobia in his right eye. Q1. What is the likely diagnosis and what are the different types/ terms used to describe this condition? Uveitis, which unsurprisingly means inflammation of the uveal tract. Note the typical history and important findings of a constricted slightly irregular pupil with ciliary flush (i.e. circumcorneal involvement of the diffusely injected conjunctiva). Anterior uveitis — aka iridocyclitis, which involves inflammation of the anterior portion of the uveal tract and usually affects young or middle-aged persons. Posterior uveitis — which includes vitritis, choroiditis, retinitis, chorioretinitis, or retinochoroiditis. Panuveitis — aka diffuse uveitis, which refers to both anterior and posterior involvement. Uveitis can be acute or chronic/ recurrent. Q2. What are the underlying causes of this condition? There are many, many causes of uveitis! NOTE: Uveitis can also occur secondary to other ocular conditions (e.g. lens-induced, post-operative, anterior segment ischemia, tumour). Q3. What features of this condition should be consider on taking a history? 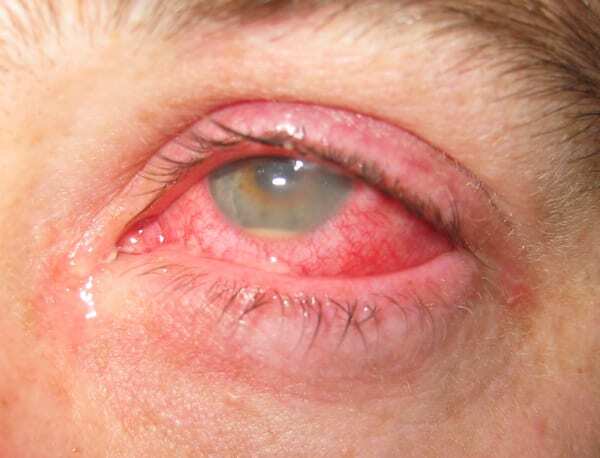 Painful red eye — deep ache radiating to periorbital or temple area, worse with movement and accommodation. “floaters” and visual changes: blind spots or flashes may be present with retinal involvement. Features of an underlying cause (see Q2) — inflammatory (HLA-B27 vs non-HLA-B27 associated conditions), infectious traumatic, or drugs. Q4. What are the features of this condition on examination? Pupils: constricted, may be irregular, and is sluggish in response to light in comparison with the uninvolved eye. Direct and consensual photophobia (the latter may help differentiate anterior uveitis from from superficial causes of photophobia). Red reflex — may be normal or altered, e.g. 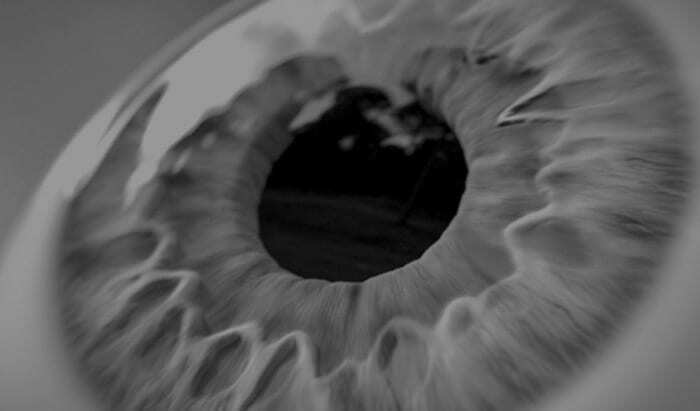 secondary cataract. Fundoscopy — look for evidence of chorioditis and retiinits, or complications such as retinal detachment. Conjunctiva — diffusely injected conjunctiva with circumcorneal involvement aka ‘ciliary flush’ (no perlimbal sparing as occurs in conjunctivitis). Tearing, but no purulent discharge. Cornea —keratitic precipitates (deposits of white blood cells on the endothelium) may be visualized and are a hallmark of iritis. There are two types: nongranulomatous (small-medium) and granulomatous (large — e.g. sarcoidosis). Anterior chamber — cloudy anterior chamber due to inflammatory cells and proteinaceous flare. Synechieae (adhesions of the iris to the cornea or lens) may be present. Look for a hypopyon. Posterior chamber — cells and flare may be present in posterior uveitis. RootAtlas has nice brief videos of nongranulmatous and granulomatous KPs, as well as an excellent ‘must see’ video demonstrating ‘cells and flare’ in the anterior chamber. Q5. What investigations are required? Investigations are rarely required as part of the emergency management of uveitis, however they may expedite subsequent treatment. Infectious uveitis, although rare, must be ruled out before treatment with immunosuppressive agents. Sometimes it is only suspected after a failure of treatment. Imaging of the sacroiliac joints if suspected spondyloarthropathy as a diagnosis. Q6. 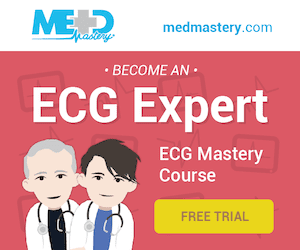 What severe sight-threatening complications may occur as a result of this condition? Q7. Describe the management of this condition. Seek and treat underlying causes. Mydriatics (eg, sympathomimetics like phenylephrine HCl) — prevent the formation of synechiae by pupillary dilation. Other immunosuppressants — may be used in steroid-dependent or refractory uveitis. Q8. What is the appropriate disposition of a patient with this condition? All cases of uveitis should be discussed with an ophthalmologist. Uncomplicated noninfectious uveitis — outpatient management with ophthalmology follow up within 24 hours. Q9. What is the classic pattern of this condition when it is associated with HLA-B27? Q10. What can be seen in the anterior chamber in the above image? 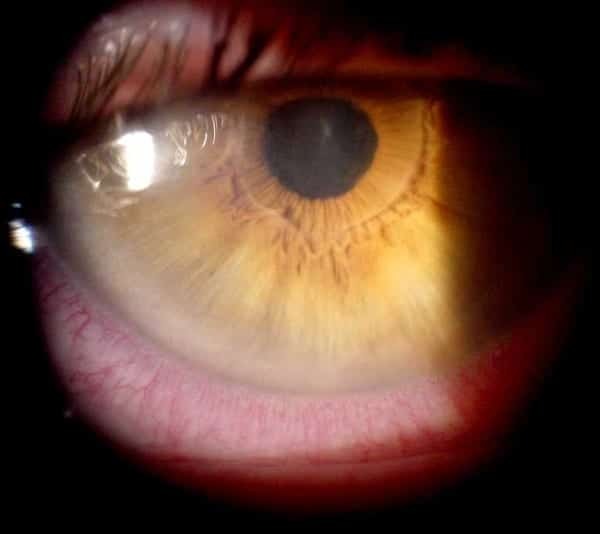 With severe inflammation leukocytes can settle in the anterior chamber and form a hypopyon, which is a white or yellowish accumulation of purulent material.